TRENTON, New Jersey, September 21, 2010 (ENS) – A resurgence in bed bugs that the New Jersey Department of Environmental Protection calls “alarming” is causing many New Jersey residents to seek quick and deadly means to eradicate the persistent insects. With an eye on safety, DEP Commissioner Bob Martin is urging residents and pest control experts to use only registered pesticides and utilize good housekeeping practices to control them. Eliminating bed bugs can be difficult but not impossible if done properly, say Martin and other experts. Hiring a licensed pest control professional can increase the likelihood of speeding up success in eliminating the bugs. The alternative is a home-applied chemical pesticide treatment. But over time, bed bugs have developed resistance to many of the chemical pesticides currently used. By the mid-1950s, bed bugs were widely resistant to DDT. The U.S. EPA has issued a pesticide alert for those who are trying to control bed bugs. Check if the product is effective against bedbugs. If a pest isn’t listed on the product label, the pesticide has not been tested on that pest and it may not be effective. 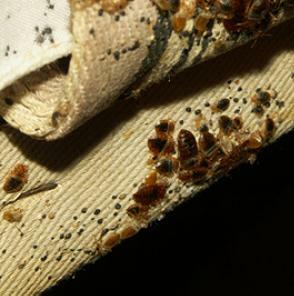 Don’t use a product or allow a pest control operator to treat your home unless bed bugs are named on the product label. Keep in mind that any pesticide product without an EPA registration number has not been reviewed by EPA, so the agency has not determined how well the product works. Bed bugs have been common in U.S. history. Although bed bug populations dropped during the mid-20th century, the United States is one of many countries now experiencing a resurgence in the population of bed bugs. Pest control companies have been reporting the infestations in multi-family housing, apartments, hotels and even hospitals on a national scale. Bedbugs are being found from the East to the West Coast and everywhere in between, according to the National Pest Management Association. Though the exact cause of the resurgence is not known, experts suspect it means the bugs have developed increased resistance to available pesticides. That coupled with greater international and domestic travel, lack of knowledge regarding control of bed bugs due to their prolonged absence, and the continuing decline or elimination of effective vector/pest control programs at state and local public health agencies has led to an explosion of the bed bug population. Bed bugs, Cimex lectularius, are small, flat insects that feed on the blood of sleeping people and animals, according to the federal centers for Disease Control and Prevention. They are reddish in color, wingless, and range from one to seven millimeters in length. They can live for up to a year without a blood meal. Bed bugs fit into a category of blood-sucking external parasites similar to head lice. Bed bugs, like head lice, feed on the blood of humans. They cause itchy bites but are not believed to transmit disease. Once inside a hotel or home, bed bugs spread rapidly from room to room through pipes, in vacuum cleaners, on clothing and luggage. In a hotel, bed bugs can spread to neighboring rooms, since guests annoyed by bed bugs may move to another room, inadvertently taking the bugs with them. Bedbugs can live in the seams of mattresses, bed frames, headboards, and box springs, but they are not just in beds. They can be in chair cushions, sofas, behind electrical outlets, cracks and crevices around baseboards, behind wallpaper or picture frames and in or under any clutter or objects near a bed. Bed bug infestations will not go away without intervention, which experts say is most effective when populations are low. First, Martin advises, confirm the presence of bed bugs by inspecting rooms thoroughly, with a particular focus on the bedroom. Look for signs of bed bugs, for possible hiding places and for openings that would allow them to enter the home. Then clean and get rid of clutter to eliminate their shelter. Martin suggests a variety of removal methods – vacuuming; employing intense heat or extreme cold, such as putting bedding into a hot clothes dryer for 20 minutes; steam cleaning or freezing bedding or clothing; and making repairs needed to prevent future bed bug invasions. Bed bugs travel. They are found in places that experience high volumes of overnight guests, such as hotel rooms and dormitories. “Be sure to check your room when you arrive and your luggage or souvenirs before you leave so you don’t carry bed bugs home,” Martin says. To prevent bed bugs, check secondhand furniture, beds, and couches for any signs of bed bug infestation before bringing them home. Use a protective cover that encases mattresses and box springs which eliminates many hiding spots. When traveling, use luggage racks to hold luggage when packing or unpacking instead of setting luggage on the bed or floor. Check the mattress and headboard before sleeping. Upon returning home, unpack directly into a washing machine and inspect luggage carefully. Myth: You can’t see a bed bug. Reality: You should be able to see adult bed bugs, nymphs and eggs with your naked eye. Myth: Bed bugs live in dirty places. Reality: Bed bugs are not attracted to dirt and grime; they are attracted to warmth, blood and carbon dioxide. However, clutter offers more hiding spots. Myth: Bed bugs transmit diseases. Reality: There are no cases that indicate bed bugs pass diseases from one host to another. Lab tests have shown that it is unlikely that the insect is capable of infecting its host. Myth: Bed bugs won’t come out if the room is brightly lit. Reality: While bed bugs prefer darkness, keeping the light on at night won’t deter these pests from biting you. Myth: Pesticide applications alone will easily eliminate bed bug infestations. Reality: Bed bug control can only be maintained through a comprehensive treatment strategy that incorporates a variety of techniques and vigilant monitoring. Proper use of pesticides may be one component of the strategy, but will not eliminate bed bugs alone. In addition, bed bugs populations in different geographic areas of the country have developed resistance to many pesticidal modes of action. If you are dealing with a resistant population, some products and application methods may only serve to make the problem worse. It is a good idea to consult a qualified pest management professional if you have bed bugs in your home.